The work on tantra entitled 'Kakacandisvarakalpatantram' comprises 51 kalpas which are presented in indivitual chapters or sections in monographic form. 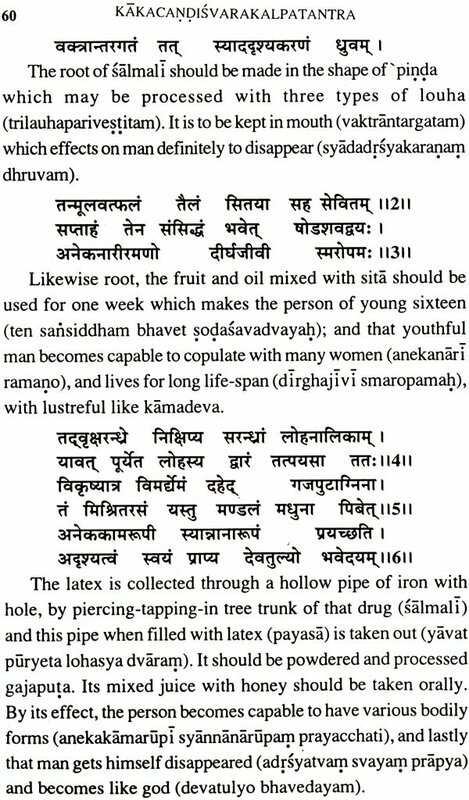 Most of the kalpas are based on a particular substance of drug (ousadhi) and it (represent- ing or leading drug) associates other drugs, material or articles (in process) within scope or range of performance, technique and utility, in different forms and modes. As regards the major drugs denoting title or name of kalpa, they are predominantly belonging to plants or vegetable orgin (padapa or vanaspati) and these cover various name of plant drugs (obtained from medicinal plants or botanical sources) coming under padapousadhis or vanousadhis, which are of important and commonly known in Indian medical science. 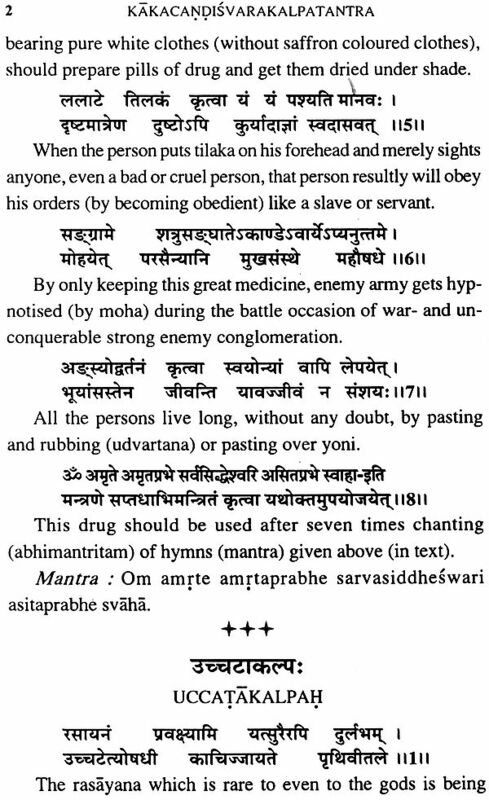 For the instance, meny title names of drugs are. 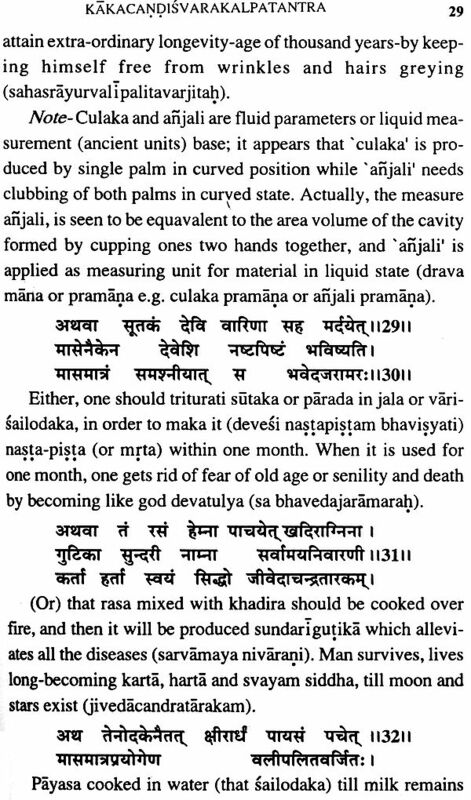 mainly included such as aparajita, asvagandha, ankola, salmali, indravaruni,nirgundi; bhrngaraja, triphala, mundi,citraka, amalaki, vakuci, nimba, katutumbi, devadali, eranda etc. 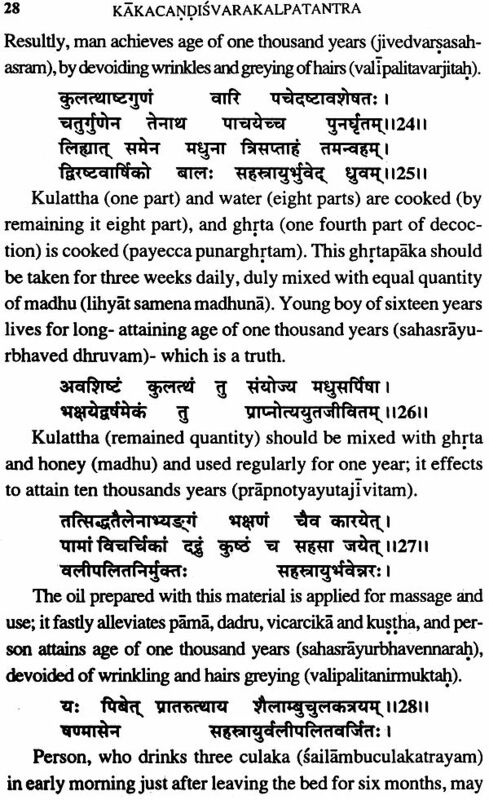 Sevral other names of spe- cific drugs appear as kalpa- titles which mainly include mahanila, sahadevi, kakajangha, Isvari, katurohini, rudanti, sriphala, vajradanti etc. 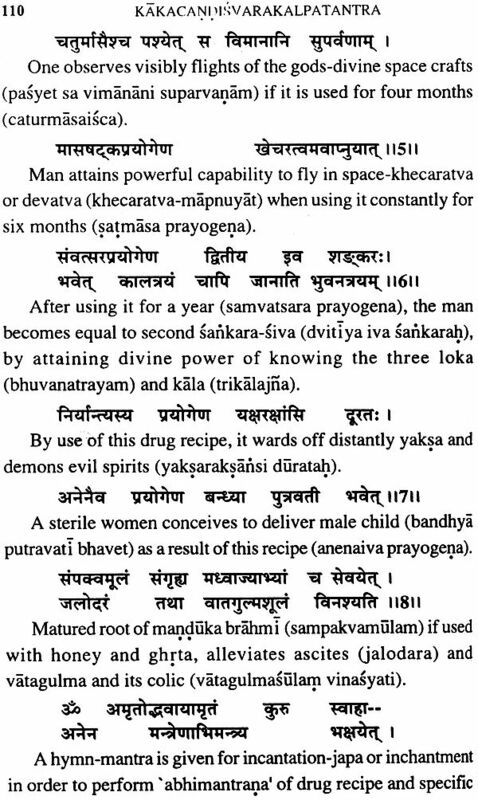 Some drugs are of specific kind such as nagadamani, uccata, laksmana, brahmavrksa, svetapalasa, krsnaharidra, trnajyoti, brahmadandi, svetagunja, sveta, bhukadamba, vajravalli etc. 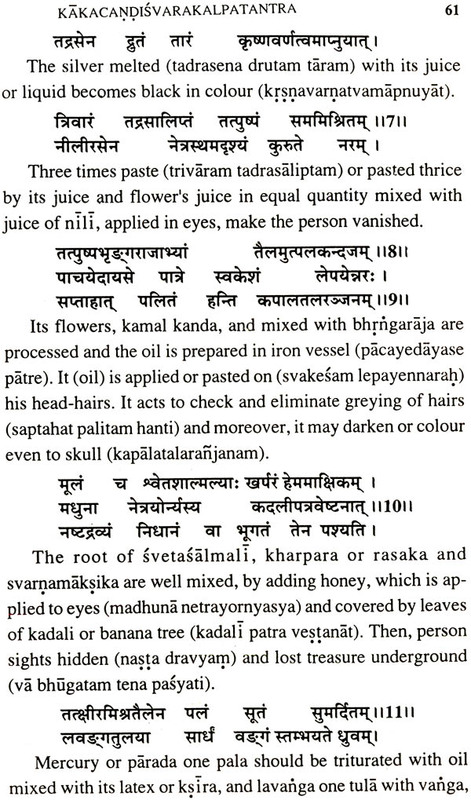 A few names of kalpa appear to be rare like uccata, ksipra, trnajyotikalpa etc. Apart from dominent group of drug plants, some kalpas are based on non- plant origins i.e. 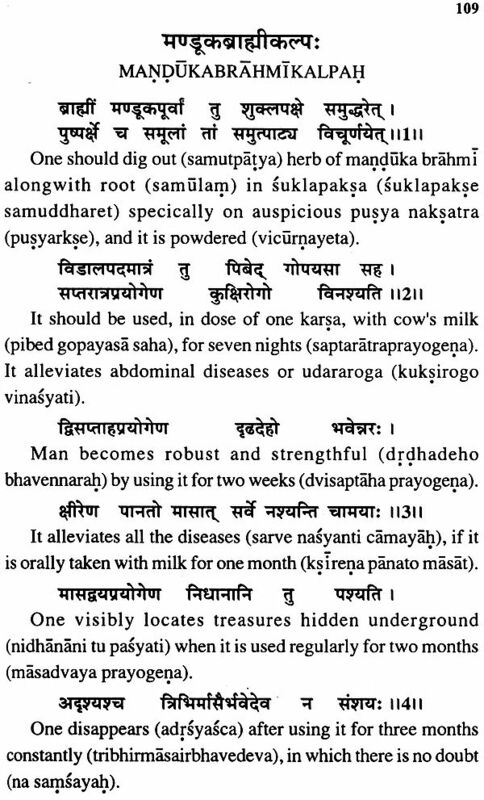 mineral and animal sources etc. 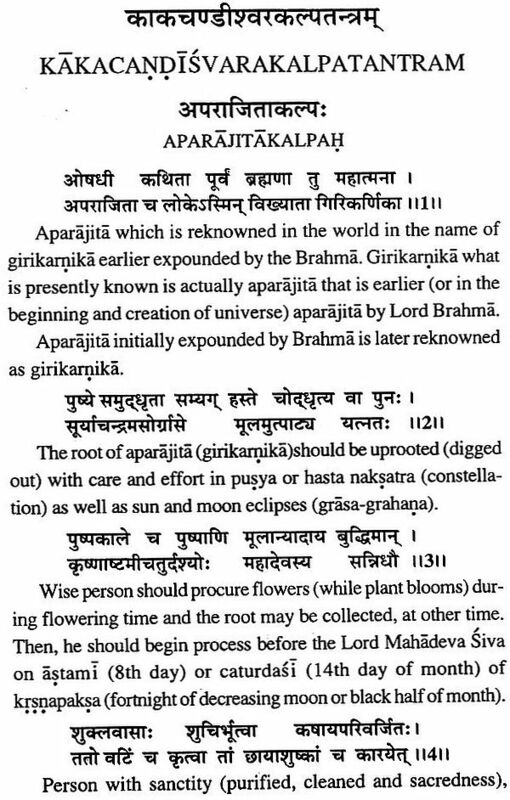 which may include mainly, gandhaka, manduka, sailodaka udaka etc. In general 'the treatise insight' sketch indicatively covers vistas, horizons and facts which are relevantly interrelated and in in- terfaced delineation of zones of purposes and objects intended variously. In this way, wideranging as well as multidimensional (involving multitiers process material and techniques) base, scope and aims may also lead to pave vast and interdiscipli- nary avenues for exhaustive, appropriate and paramount stud- ies visualizing vital interaction between tradition and science .